Trinity Fields School and Resource Centre in Caerphilly has become an IQM Flagship School. “We are grass-roots up, not top-down”. A visitor is struck by the atmosphere of trusting, happy relationships, with the quiet purposeful calm, punctuated occasionally by laughter as staff and pupils, using first names, gently tease each other or share a joke. Trinity Fields School and Resource Centre is a purpose-built Special School, occupying well-designed and constantly upgraded buildings and grounds, currently having 148 pupils aged between 3 and 19 years old on roll, and expanding year on year in a controlled, resourced programme, with 156 pupils expected in September this year. Nearly all pupils have statements of special educational need, and those without statements are currently undergoing statutory assessment. There are 31 children in the Foundation Stage, and satellite classes are in place for some secondary aged pupils at St. Cenydd’s High School (taught by Trinity Fields teachers) and for some primary aged pupils (also taught by Trinity Fields’ teachers) at Cwm Ifor Primary School. 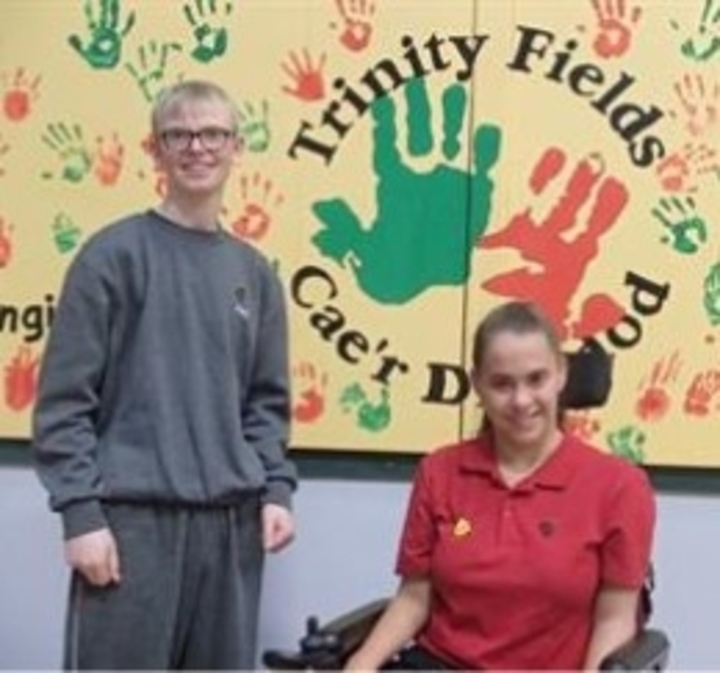 In this way, Trinity Fields pupils experience a range of opportunities to develop social skills and self-esteem, to enhance personal skills, interests and talents, while pupils at the mainstream schools benefit from getting to know fellow pupils their own age meeting the challenges of a variety of disabling conditions. as the Headteacher puts it. The school takes development in its stride. The new Curriculum for Wales, “Successful Futures”, is already being incorporated, with pupils involved in the planning. Trinity Fields has a large catchment area, extending beyond County boundaries as its reputation has grown. Careful financial management, with particularly strong Local Authority support, has led to well-planned improvements in the buildings and site, creating enhanced outdoor learning facilities and additional indoor teaching spaces. “Expansion is at our pace” says the Headteacher, who feels he has the full support of the CEO. The Headteacher can check the speed of the school’s growth through his membership of the admissions board, so that resources are put in place before the school expands, allowing all new and vulnerable pupils to be properly assimilated. “what makes each child tick and what makes each child tock”. Because he and his staff know each child and their family so well, behaviour management, learning opportunities, curricular strengths, personal enthusiasms and home links can all be harnessed for the benefit of the individual. Trinity Fields benefits from a particularly supportive Local Authority, and there are active local services such as Health, Social Services, Safeguarding and Bereavement counselling which form effective teams around vulnerable families when needed. Lastly, by all external measures of effectiveness, Trinity Fields pupils achieve remarkably well. They can access GCSE courses, they find college places at 19, they make good progress in THRIVE measures of wellbeing and emotional literacy, they play an active part in the running of the school and they learn skills of independence alongside a genuinely broad and balanced curriculum which opens their eyes to a wider world.